In stock trim, the R53 Mini Cooper isn't lacking in character. The first iteration of MINI's return to the US market renewed the brand as an instantly recognizable icon. The attention was justified and before long tuners had a new toy to play with. Read on to see how we modified out MINI for maximum ROPI (return on performance investment). The MINI brand quickly spawned new relatives, and the family now includes seven unique models ranging from a two seat MINI Coupe to a four door, jacked up MINI Countryman. They have held their value extremely well, but because the cars have always been relatively affordable (especially if you keep your hands off the excessive options list), a used first generation (R53) MINI of the "S" variety like ours, or even the high performance "John Cooper Works", can be had for under $15,000 in good to excellent condition. 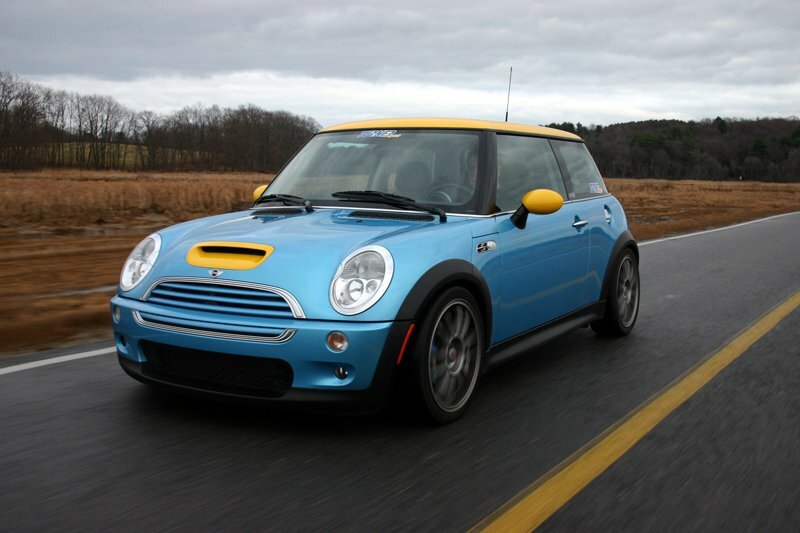 Behind the wheel, the supercharged MINI is one of the most exciting FWD cars you can drive, period. There is no lag compared to the later turbocharged models, and the audible whine of the blower encourages you to push harder. The steering is hard-wired to your hands, always predictable but so sharp it could be considered darty. But while it may be wild fun on back roads, your whole perspective is readjusted when merging onto the highway. Torque and horsepower curves are linear, progressively building toward a high rpm climax but unfortunately that leaves a big hole where you wish there were more power. So that's right were we started. 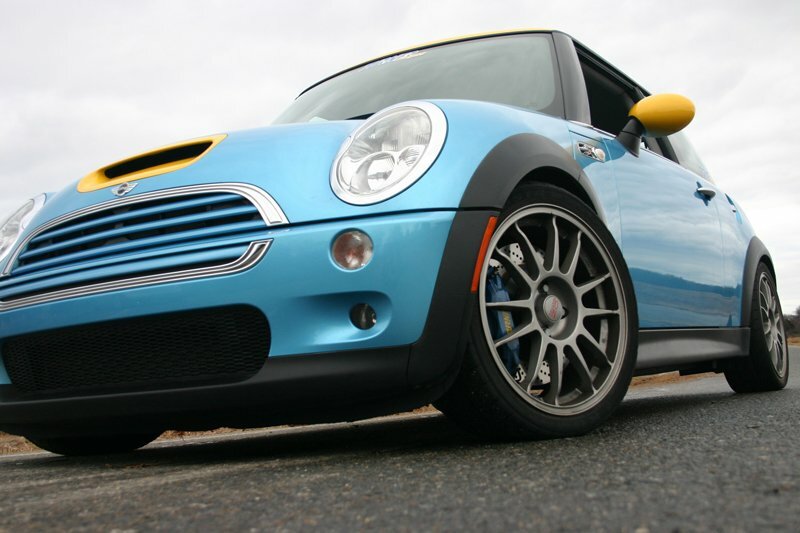 We first installed our Power Pulley package on our blue and yellow project MINI Cooper S in December 2002. All we can say is.... "WOW!" This car is faster than an E36 M3! Over the next year we put 20,000 trouble free miles on the car. The Shark Injector for the Mini S increases your rev limit by 200 and removes the top speed limiter. Kit includes a new supercharger belt, a set of special BOSCH spark plugs designed for the Mini Cooper S running higher boost ;custom TMS/Conforti software loaded in;a "do it yourself" Shark Injector unit - no need to send out your ECU! ; And a two-piece billet aluminum supercharger pulley with stainless steel self-centering insert. The smaller supercharger pulley increases boost from a stock 10.5 to 14.5 lbs - this increased boost is especially noticeable at lower RPM, making your Mini S even more fun to drive than it is now. With the increased boost, and a better spark working with the ECU, we hooked up Borla's cat back exhaust. This Cat-Back system is a simple bolt-on made of 100% stainless steel inside and out. Twin round tips fill out the rear valence perfectly with no rubbing. The stock system weighed in at 45.5 LBS, the Borla weighs 33.5 LBS. With our in-house Dynapack Chassis Dyno, we tested many different exhaust sytems currently on the market for the Cooper S. The Borla came out on top! Dyno results showed a peak gain of 6-7 HP power at 6250 RPM, but power increases from 3700 RPM to redline. 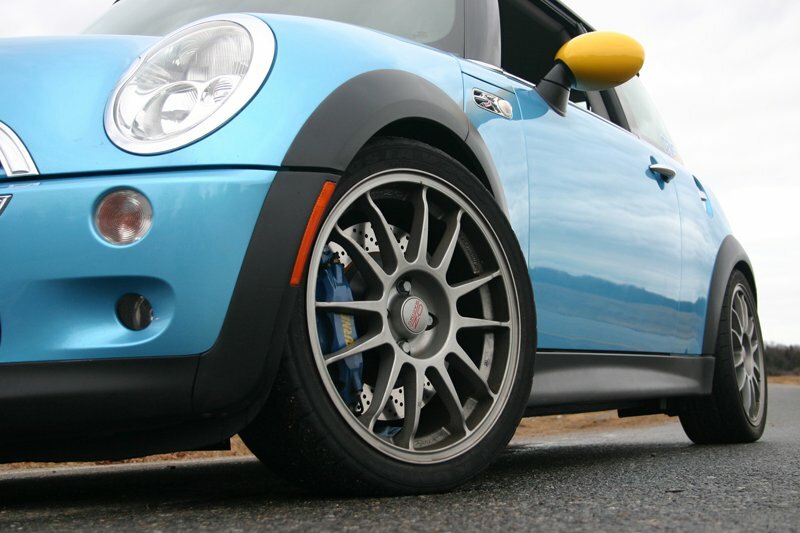 The MINI is lightweight, so we expected the brakes to be good. They delivered, with good pedal feel and easy modulation between full braking control and ABS intervention. These brakes are fine for most owners, but we wanted a MINI whose calipers wouldn't give up on its rotors under heavy abuse. StopTech's big brake kit was a logical choice. This front brake upgrade features 328x28mm floating front rotors drilled or slotted with 7075 T-6 Billet aluminum hats, ST-40 four piston caliper black anodized, front stainless steel brake lines, AXXIS Ultimate brake pads, and requires 17 inch wheels. Like many cars with sporting pretensions, the MINI Cooper S arrives from the factory with a stiffer suspension than the regular Cooper, but it feels dampened enough that most drivers would consider the ride comfortable. There is certainly a bit of lateral sway as well, so we aimed to keep the comfort of the ride while eliminating body roll and adding an advanced Coil Over kit. The H&R Coil Over kit takes the traditional shock/spring package one step further. H&R combines their progressive-rate springs with specially valved shocks and adds height adjusters that let you set the ride height to your own personal tastes. These coil overs are designed for street use with progressive rate springs that start out soft and stiffen as they are compressed. The ride on the MINI is stiff but not bone crunching while still giving better handling and balance. On the body roll side of the equation, we added H&R front and rear sway bars to stiffen up the chassis rigidity. Now our turn-in matches the steering completely and where the MINI previously felt capable now it feels truly competitive. The MINI thoroughly benefits across the board from our tweaks. We feel that we have built a car now geared directly towards the high performance enthusiast, rather than someone who simply enjoys the MINI as an iconic "fun" car. The power is now fast compared to any car, not just fast for a MINI. With the amplified sound of the blower from the drop-sized pulley and the Borla exhaust it makes every blip of the throttle that much more enjoyable. Likewise, the car feels more planted in just about every handling scenario we could throw at it. It's almost a challenge to see if you can possibly find a way to upset the car's fantastic balance. The short wheelbase makes it incredibly tossable, and with just a bit more tire than stock we can keep the power flowing and the momentum up through the bends. 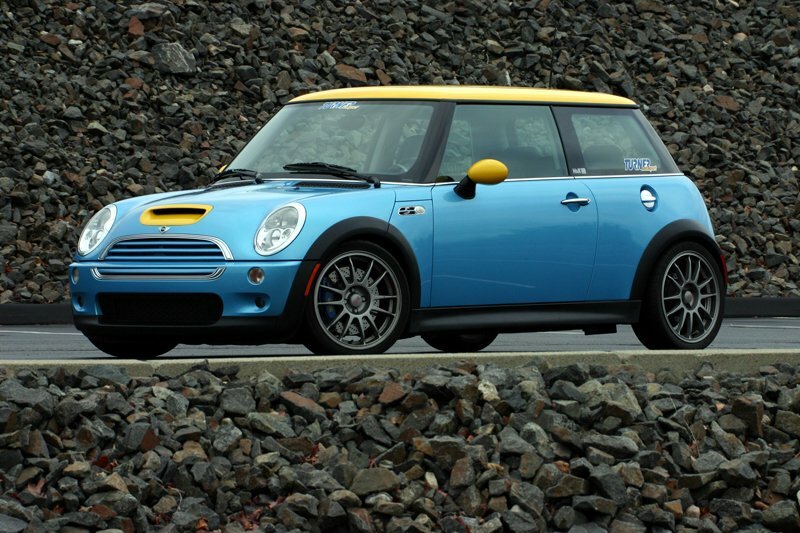 With MINI's becoming a performance bargain, think about Turner Motorsport's MINI parts for your next toy project. This intake kit replaces your restrictive factory air box to give you more power and better throttle response. Enclosed in a durable 16 gauge, powder-coated heat shield; this air intake system features a washable/reusable conical air filter that improves airflow for increased horsepower and torque. Heat shield requires little or no assembly and the filter is constructed with 100% polyurethane for long life and multiple cleaning cycles. This 264/272 degree cam for the MINI Cooper S provides a smooth linear power gain from midrange to redline, while idle smoothness is retained. We have seen a 6-8 Horsepower gain from the install of this cam on a stock car - more if the car has been "Sharked" or has have the boost increased. If you're changing your supercharger pulley, you'll need this tool to do the job. This tool mounts easily to take the tension off the supercharger belt. The Shark InjectorTM installs through the OBD-II port in your car  no need to remove your ECU and ship it anywhere! Shark InjectorTM software re-maps the fuel and ignition data at part-throttle and wide-open throttle to take advantage of high octane fuel. The Injector was developed by Jim Conforti whose BMW programs are generally regarded as the best performance software that money can buy. 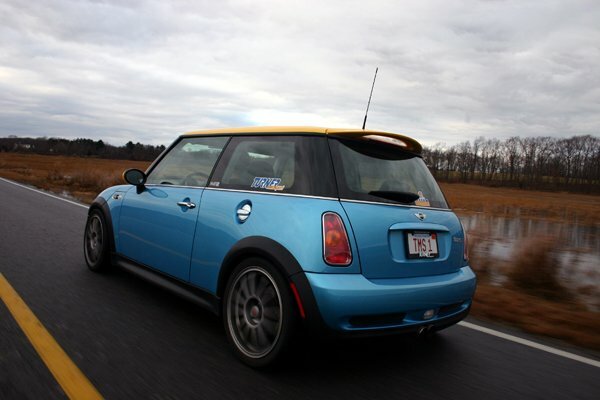 The Mini software was developed on the dyno in his development facility to give you more horsepower and torque, quicker and smoother throttle response, a higher rev limit, and removal of the top speed limiter. The Shark InjectorTM is compatible with many different modifications: most supercharger pulleys, cold air intake kit, cat-back exhaust, and others so there is no need to re-tune your car after every modification. This is the easiest software tool available for the Mini Cooper S with only a battery charger required for installation. Among the other benefits is the ability to restore your car back to stock for trips to the dealer. The Borla Race exhaust is uses smaller mufflers to create a very aggressive, loud, and fun sound. 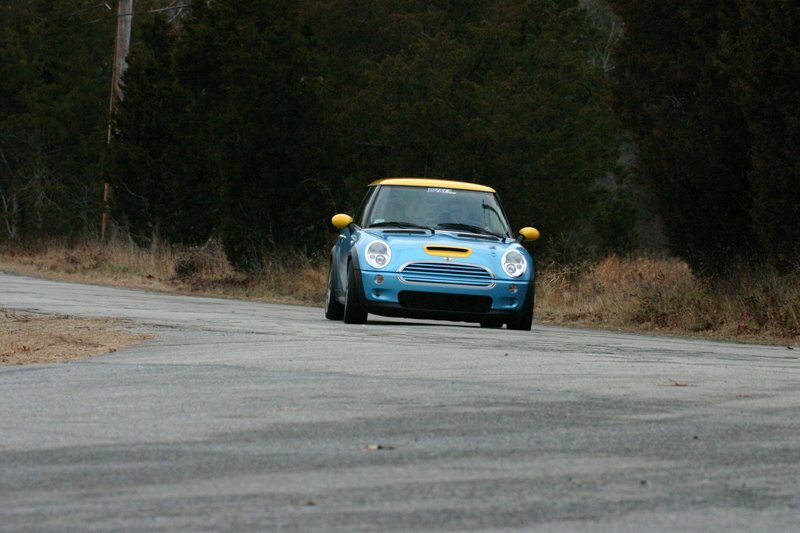 The Race is intended for people who want their MINI to bark and not be inconspicuous. Where the Borla Street exhaust is great for people who want to hear the engine a tiny bit more, the Race is an exhaust that you will hear all the time. It pops and burbles with every lift off the gas and creates a throaty rumble as you rev through the RPM band. It's a very un-MINI like sound that actually works well with the MINI's motorsport and sporting heritage. It installs on to the factory cat section with all of the factory gaskets and hangers. This Supersprint Header for the MINI Cooper and Cooper S provides lightweight stainless construction combined with superior flow for increased performance. StopTech Brakes puts championship-winning race technology and state-of-the-art engineering under your feet. StopTech's Front Big Brake Kit for MINI R50/R53 models is engineered to work with the stock brake hydraulics and ABS/DSC system. StopTech builds each kit around the specific vehicle dynamics, engineering the system to achieve the correct brake balance. This brake upgrade gives better stopping performance in everyday driving, aggressive street driving, or all-out track days. By increasing the rotor size, using a larger pad, and a fixed forged aluminum caliper, you can improve your braking performance substantially for any condition! StopTech Brakes have been used on Turner Motorsport racecars since 2003, winning 5 sports car championships and recording numerous race wins since. MINI Cooper / MINI Cooper S braided Stainless Steel 4 Pc. Brake Line Set - These lines are DOT approved and also feature a clear plastic outside coating. Replace those soft, inferior rubber brake hoses! Stoptech® Stainless Steel Braided Brake Lines provide a quicker, firmer, more consistent pedal response by maintaining consistent brake pressure. Additionally, stainless steel lines provide precision brake modulation, especially during threshold braking. The improvement in pedal feel is more dramatic on older vehicles where the factory rubber line may have softened and swelled due to age. 27mm front sway bar / swaybar for MINI Cooper and Cooper S. Includes bushings. H&R Sport Sway Bars are designed for drivers who desire improved handling without lowering or affecting ride quality. H&R Sport Sway Bars increase your suspensions roll stiffnessor its resistance to roll in turnswhile maintaining ride comfort and dramatically increasing cornering control, lateral stability, and grip. A unique feature of H&R Sport Sway Bars are the smooth, machined-like forged ends that, for specific vehicles, allow for adjustability in stiffnessgiving you an unmatched level of precision and performance. 2 way adjustable 19mm rear sway bar / swaybar for MINI Cooper and Cooper S. Includes bushings. H&R Sport Sway Bars are designed for drivers who desire improved handling without lowering or affecting ride quality. H&R Sport Sway Bars increase your suspensions roll stiffnessor its resistance to roll in turnswhile maintaining ride comfort and dramatically increasing cornering control, lateral stability, and grip. A unique feature of H&R Sport Sway Bars are the smooth, machined-like forged ends that, for specific vehicles, allow for adjustability in stiffnessgiving you an unmatched level of precision and performance. Location: Front Type: Street, Stage 1 Bearing: captive-ball fully encased in polyurethane These front adjustable camber/caster plates will replace your stock front upper strut bearing. The KMAC plates are a 'floating' design so camber and caster are adjusted together. This design allows maximum range of adjustment since no other hardware interferes with the adjustments. Since these replace your stock strut bearings they are designed to work with a stock-type spring only. And when installed correctly will not significantly alter ride height. Adjustment is easily done by loosening the three nuts on top of the tower and sliding the camber plate into the position you want, then re-tighten the nuts. These mounts can be installed two ways - for camber correction or swapped side-side for increasing negative camber. Detailed instructions included. The Quaife torque biasing differential enables your car to accelerate quicker and corner faster. How? By getting the power to the ground! The Quaife Differential powers both drive wheels under nearly all conditions, instead of just one. With an ordinary open differential, standard on all MINI's, a lot of precious power is wasted during wheelspin under acceleration. This happens because the open differential shifts power to the wheel with less grip (along the path of least resistance). The Quaife, however, does just the opposite. It senses which wheel has the better grip, and biases the power to that wheel. It does this smoothly and constantly, and without ever completely removing power from the other wheel.